If you know me, you quickly learn (or observe 🙂 ) that I love accessories in clothing. I love knowing that I can take an otherwise plain outfit and completely alter its feel by the jewelry, scarf, hat, purse or shoes I choose to wear with it. And I highly enjoy matching the style of my outfit to my mood. That way when I walk out the door, what I’m wearing that day represents ME. Some days I’m preppy, some days I’m boho, sometimes I’m romantic, and sometimes I’m goth. (Okay, not really. 🙂 ) But I like to mix it up when I can. So it only makes sense that just like in clothing, I love to utilize and change out accessories in room design. And today, I want to share with you one of my favorite techniques for creating a room that allows for variety in accessories (pillows, vases, flowers, frames, etc.) throughout the year. There are several main design elements in a room that can give you color or pattern. To name a few, wall color or paper, furniture, pictures, window treatments and rugs are some of the main elements. In this technique, you are going to choose one main design element in your room that creates your color palette to work from. Ideally, the more colors this piece has, the more variety you put in the room throughout the year. So some people may pick curtains with a lot of pattern and color. Others may pick a crazy wallpaper (yes, wallpaper is back in style). Others may choose a bold patterned rug. I would say whatever most inspires you when shopping is a good place to start. Step 2. Keep Other Design Elements in Room More Neutral. Once you choose what item in the room will serve as your color palette, you can then keep other big things in the room more neutral in color, in order to leave way for you to create variety in your accessories. In my specific room, since my rug is bold, my couches are more neutral. However, that doesn’t mean your couches can’t have color. I have picked blue couches that I had covered in a jewel-tone fabric because just like denim they still remain able to match a variety of color schemes. And I love their pop of color. Step 3. Vary Accessories Based on Time of Year and Season. The final step is just choosing accessories that allow you to have fun and change the feel of the room per time of year or occasion. With accessories and little ones, my favorite store to shop at is Home Goods because I can normally find great prices on cool items that do not break the bank. Which is absolutely necessary because if I bought a decorative bank, it would likely get broken. Now I’m going to show you how I vary my room throughout the year. As noted before, I used my rug to create my color palette, which provides me several different colors to accent with throughout the year. And obviously my decorating style may not be anything similar to your own. And that’s great! This is not meant to tell you how to decorate but inspire you to utilize variety. 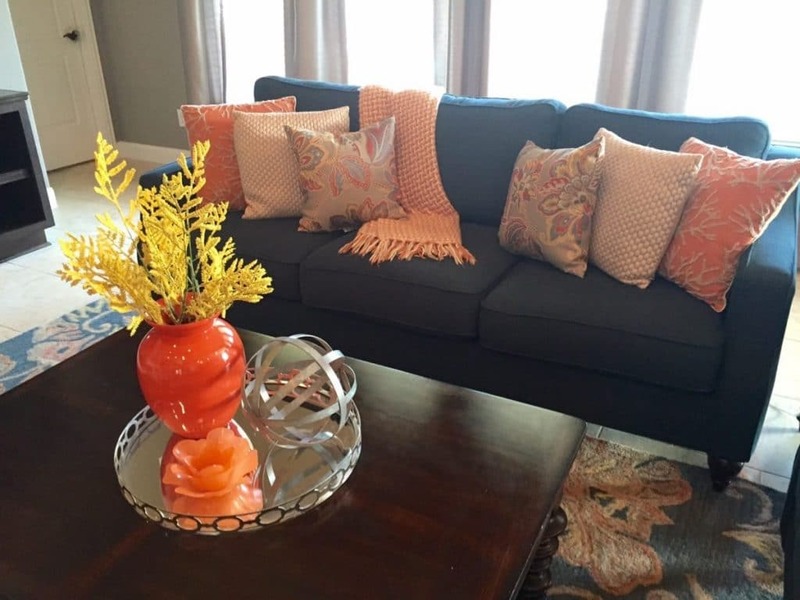 In this specific picture, I have decorated for Spring so I accented with wispy, light yellow flowers and pulled in yellow and coral for my pillows. Note, I keep nothing next to my glass lamp because Kai loves to break anything there. Here’s a bold look of color for summer with brighter accessories and some patterned pillows. Note blankets are a great way of adding color and warmth to a room despite the fact that no one where I live wants to look at a blanket in the blazing heat of the summer. So maybe blankets are better for Fall or Summer. At this time of year, I pull out the orange hues. And incorporate some pillows with more of a rusty orange in them. This is my absolute favorite look. I love FALL. As you can also see I changed my greenery and vase. Here’s some fun with Yellow for a clean and bright look. Typically fruit would stay near a kitchen but our living room and kitchen are adjoined so this works. I have about 50 more looks I took pictures of, but I figured that at this point after looking at these pictures, you get the picture I’m trying to get across…accessories are fun. And I hope these ideas have inspired you to have fun using color, accessories and variety to make your nest feel fun, fresh and appealing.